Scientists at the Multi-Scale Robotics Lab at ETH Zürich have developed a tiny magnetically-guided microbot designed to be embedded in the eye to perform precision surgery or to deploy precise amounts of drugs. The researchers demonstrated the viability of the technology in tests on rabbits. The robots used in the procedure has a diameter of 285 µm. The magnetic microbots are powered using external magnetic fields. Known as the OctoMag, the robots can produce magnetic forces and torques in three dimensions. The robot is so small that it could be used to help dissolve clots in the vessels of the eye. 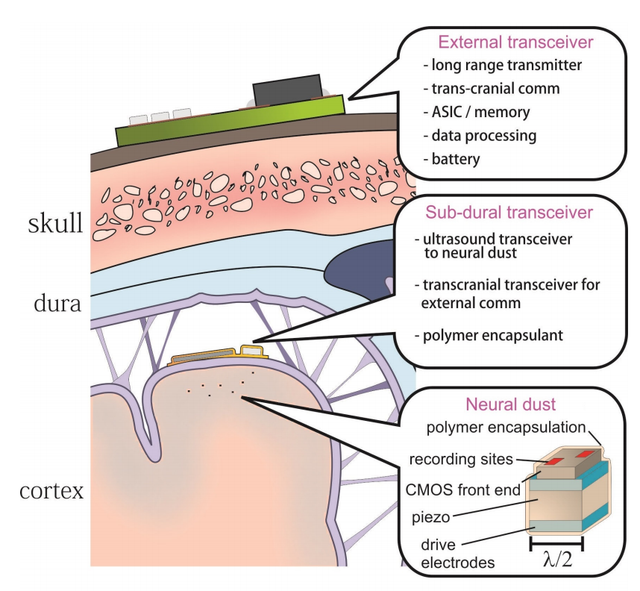 A separate group of researchers are seeking to disrupt brain-machine interfaces by developing dust-sized devices that could potentially last a lifetime. Based at the University of California, Berkeley, the researchers propose a brain-machine interface that makes use of thousands of sensor nodes that would be implanted within the cortex. There, they would communicate with a transceiver located on the cranium, which would deliver piezoelectric power to the sensors. A node on the head would provide battery power and computing horsepower. It may be a while before the researchers develop a working model of the neural-dust based system. As the Technology Review puts it, the project "is littered with challenges beyond the state-of-the-art." Still, the researcher team has a significant background pushing the boundaries of electrical and neural interfaces. For instance, one of the researchers, Michel Maharbiz, PhD, helped develop a remote controlled beetle. Earlier this year, a Berkeley publication cited brain-computer-interface research at the university that might one day enable the paralyzed to walk. That's obviously a big goal, but as Maharbiz put it in the article: "I think in California, we are poised to make big advances in BMI."